Article first published (in German) in "Historische Bürowelt" (C. Vande Velde, HBW (2013) Nr. 94, pp 17-24), and reproduced here in translation, with permission. Based on differences observed from a few low-quality pictures of Brunsviga N° 633 in the Braunschweigisches Landesmuseum, Valéry Monnier ( www.arithmometre.org , www.ami19.org ) made the intriguing suggestion that the “latest known short-crank Brunsviga” was perhaps not a Brunsviga at all. There are three Brunsviga machines known with a long crank support, and serial numbers between 490 and 579, so it is a very legitimate question why Brunsviga N° 633 would still have a short crank, if the approximately 200 machines before it would already have the long crank, which is an obvious improvement. There have been stories of short-crank machines retrofitted with long cranks, but the list of known early Brunsviga machines displays only short cranks up to number 490, and thereafter only long cranks, with the exception of N° 633. A number of possible differences between N° 633 and other Brunsviga machines was pointed out by Valéry Monnier, but most of the deduction was done from pictures of insufficient quality to be able to tell whether the difference was real, or an artifact of the photography. We tried to collect data on a number of Brunsviga and Odhner machines with low serial numbers, and indeed did uncover some differences between them, but the main problem remained a lack of data or good photographs of Brunsviga N° 633. The solution turned out to be easy – I took my own Brunsviga N° 342 to the Braunschweigisches Landesmuseum and arranged with the curator for a small fact-finding mission and a side-by-side comparison between N° 342 and N° 633. The current hypothesis is that Brunsviga N° 633 is in fact a re-badged Odhner’s arithmometer. In order to provide further material for comparison, Chris Hinchcliffe of the Tekniska Museet in Stockholm made pictures of an early Odhner Arithmometer with N° 525, and also took some measurements, and Reinmar Wochinz kindly provided the opportunity to take pictures of his Odhner Arithmometer with N° 814, these numbers nicely straddling the N° 633. Further material for comparison comes from the Arithmeum, with Brunsviga N° 285 and Odhner’s arithmometer N° 765, and of David Green, with Brunsviga N° 965. We will start with a drawing of the various measurements taken on the machines. Table 1 – Measurements of several Brunsviga and Odhner machines. Measurements in magenta and green are down to 0.1mm, light blue measurements are down to 1mm. Numbers in magenta appear to be useful to make the distinction between machines manufactured by Brunsviga and Odhner. Next is a list of all the points of difference that were found between Brunsviga N° 633 and N° 342, illustrated with photographs whenever possible. If a photograph contains two images, the picture of Brunsviga N° 342 is always on the left side, and N° 633 on the right. If there are three images, they are Brunsviga N° 342 on the left, N° 633 in the middle, and a picture of an early Odhner arithmometer (either N° 814, N°765, or N° 525) on the right. 1)	There are circular depressions for mounting the rubber feet in the bottom plate of N° 633, and there is only one screw hole in the middle. There are two screw holes for N°342, and a flat bottom plate. 2)	Screw locations for the side castings are also in different locations between the machines, to clear the cutout for the rubber feet in N° 633. 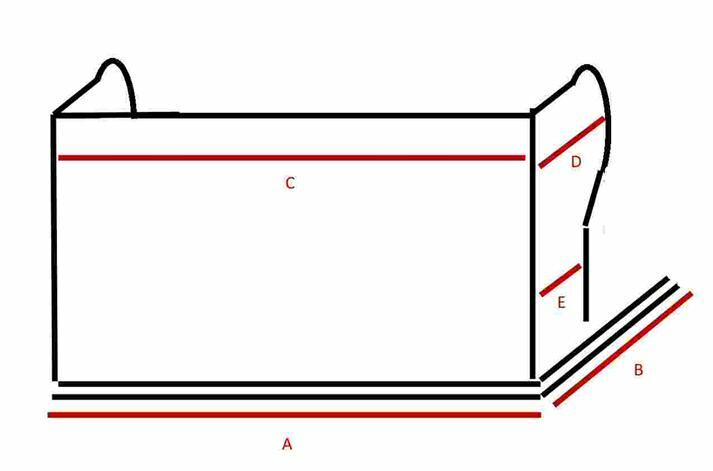 4)	In N° 342, there are slits cut for locking the carriage into the top of the bottom plate that protrude all the way to the front of the plate, leading to rectangular holes being visible at the front of the bottom plate. For N° 633 the slits do not continue all the way to the front of the machine. 5)	The lower edge of the casting on the righthand side protrudes further forward in N° 633 when compared to N° 342 – the shape of the cutout in the casting is different too. 6)	The carriage of N° 342 has holes over the counter register. N° 633 has silver dots. There are also holes over both registers, which are smaller than the ones that appear in other machines, and which could have been made later. The comma slider rails that have been added are later still, as they defeat the purpose of the holes. 7)	The front carriage shift ears are closer together on N° 633 than on N° 342. Normally, Odhners do not have carriage shift ears. Again, this may have been a later addition. 12)	The screw pattern on the bottom of the carriage is completely different between N° 633 and N° 342. 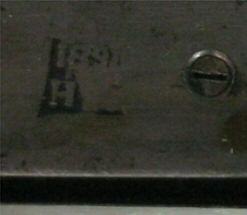 13)	N° 633 has a stamp on the bottom of the carriage that reads “1891 H”. It would be logical that this would be the year of its construction, and it would also signify that it was constructed before calculator manufacture was taken up at GN&C in 1892. 14)	Whereas the crank handle of N° 633 is profiled, in N° 342, there are no compound curves – simply circular bosses with a straight piece of metal in between. 24)	There is a spacer ring present between the crank gear and casting in N° 633, whereas there is none in N° 342. 25)	The casting on the final tens carry segment is completely different for both machines. 26)	N° 633 has a reset rod for the tens’ carries in positions 11, 12 and 13. N° 342 does not have this. 27)	Numbers 0-9 are stamped into each pinwheel disk for N°633, not so in N°342. 30)	There is a different font in the revolution counter, especially the shape of the 5 and the 7 is tell-tale. 31)	The font in the result register is also different. Here the numbers 3, 4, 7 and 9 and most different. 32)	There is a riveted “Brunsviga” logo on the top plate of N° 633, whereas the logo in N°342 is simply stamped. 34)	The font of the serial N° is very characteristic for Brunsviga, with double horizontal stripes through every number and letter. The font for Odhners varies, but N° 633 does not have the Brunsviga script for the serial N°. 35)	The font of the numbers on the setting plate is different, those on N° 633 being slightly wider, overall. 38)	Slits in the top cover for the setting pins to pass through are slightly longer at the bottom of N° 342, when compared to N° 633. 39)	End of the clearing shaft is hollow in N° 633 on the counter register end. 40)	N° 633 has a carriage stop on the left hand side (removed in this picture). N° 342 lacks this feature. 42)	N° 633 lacks a screw and screw hole at the bottom right of the top cover, which is thus only attached with 3 screws. Finally, a colour-coded table with a number of these differences follows, in which the various machines on which we have information are compared. Missing information for some machines is simply omitted from the table. Any row which is consistent for all Brunsvigas or Odhners which have been studied is coloured green (Brunsviga) or blue (Odhner). If one machine in the row is different, it is coloured red. If more than one machine is different from the rest, the row is not colour-coded, and is not considered a workable criterium for comparison. Odhner machines having the same properties as the Brunsvigas in the first columns are also coloured green. In the middle column for Brunsviga N° 633, a blue colour indicates the features are identical to those in the Odhner columns, green indicates that features are identical to the Brunsviga columns, and red indicates that the distinction between Brunsviga and Odhner is either absent, or non-conclusive. Orange occurs if a feature of Brunsviga N° 633 is different from all other machines that have been included in this study. It is clear that very few features of Brunsviga N° 633 point towards its having been constructed in the Brunsviga factory. Most of the column is blue, orange or red, pointing towards features that are either unique, or Odhner like. 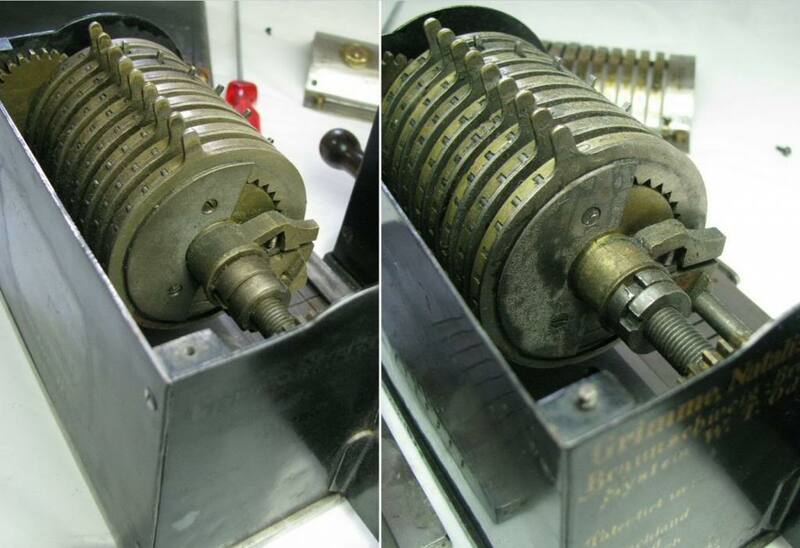 There are only three features that appear Brunsviga-like, namely first the large clearing wingnut for the register, which can easily be a later replacement or improvement, second the presence of a reset rod for the tens’ carry levers in position 11, 12 and 13, which is not observed in any of the early Odhner machines, but is present in some of the early Brunsvigas, and thirdly, and this is the most worrying of the three, the position of the top left screw for affixing the carriage cover, which is not right next to the final window of the counter register, but higher, in the position where it also sits in Brunsviga machines. With the carriage cover off, there is no trace of a tapped hole in the expected Odhner position either. This would mean that the entire casting for the carriage should have been exchanged, which is inconsistent with other observations, most importantly with the fact that the carriage cover does not follow the Brunsviga template, and that the carriage baseplate is dated 1891 and fixed with screws in completely different locations than in a Brunsviga machine. 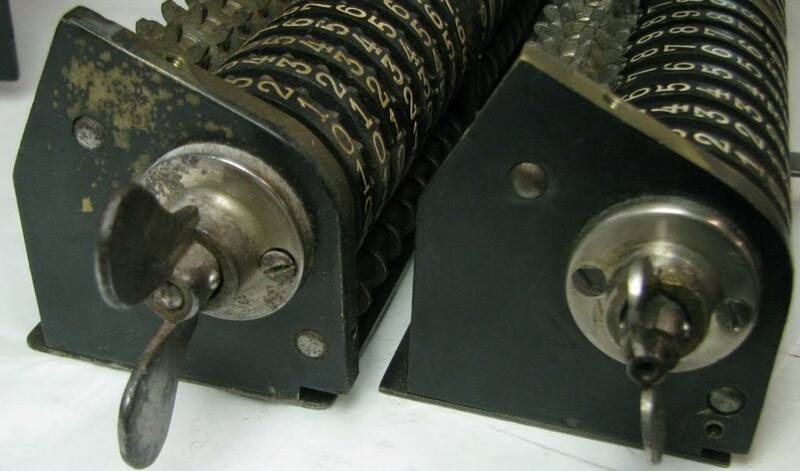 Of all the other orange-coloured observations, many have probably been caused by GN&C personnel studying, reassembling and updating the calculator – number stamps to the pinwheel disks, extra holes over the registers, shift ears added to the carriage, halving the pinwheel cylinder locknut to provide two nuts and a more secure hold, tampering with and replacing tens’ carry arms, all of these are updates and details that could easily have been changed on a standard Odhner arithmometer, as are the riveted “Brunsviga” script and the soldered gold-coloured GN&C logo, which looks suspiciously like the logos used on their sewing machines from the 1890’s. In addition, there is the 1891 stamp on the bottom of the carriage, which dates the machine to a point at which calculator production had not yet started in Braunschweig. All of this leads us to conclude that Brunsviga N° 633 is in fact former Odhner Arithmometer N° 633, sent from the factory in St. Petersburg to Braunschweig when the patent was licensed to GN&C. As a working model, it was probably instrumental in clearing up any ambiguities that might exist in the drawings for the machine. What has happened to it afterwards is not entirely clear. The modifications and improvements, and especially the fact that GN&C went to great lengths to disguise the machine as a Brunsviga, might suggest that it was sold at some point, possibly after the proprietary calculator production reached similar numbers, the production process appeared to be well under control, and improvements had started to be made (long cranks around machine N° 450). This might have increased confidence up to a point that conviction arose that the machine would no longer be needed, and could be sold off for profit. This is not the only machine known which was Brunsviga-ised. Also Odhner’s Arithmometer N° 739 received a different name and logo (according to the Brunsviga museum catalog – “In the number log of the manufacturer we find the record “Schlosser Original Odhner”, so that the assumption can be made that it was widened to 15 positions and provided with a long crank handle by the mechanic Schlosser”), and later somehow made it back to the Brunsviga calculator collection. This seems to concur also with the patent information on the side of N° 633, which has rather a lot of patents on it, and the conspicuous alternative spelling of the word word “Patentirt”. Brunsviga N° 1782 has this exact same decal, and it continued to be used until at least N° 5700. On the other hand, from rechenmaschinen-illustrated.com, it is clear that machines N° 965 and N° 2875 each have a patent information decal which is different, both from each other and from that on N° 633, N° 1785 and N° 57xx. It would be interesting to find out what the patent information decal looked like on machines between rougly N° 500 and N° 1750 – a clear determination on when the “Patentirt” decal began to be used could be a useful handle to when N° 633 was mocked up as a Brunsviga. For N° 633, the wear to the top plate, as well as the replacement of some of the tens’ carry levers with used parts, and the modifications to the wood bottom plate with the added clamp to keep the machine in place while cranking, all suggest that the machine was intensively used during part of its life, whereas it would not have been had it remained as a factory model just to study. From the GN&C archives, in particular the museum catalog which dates back to the 1950s, it is clear that by then the calculator was back in the collection. 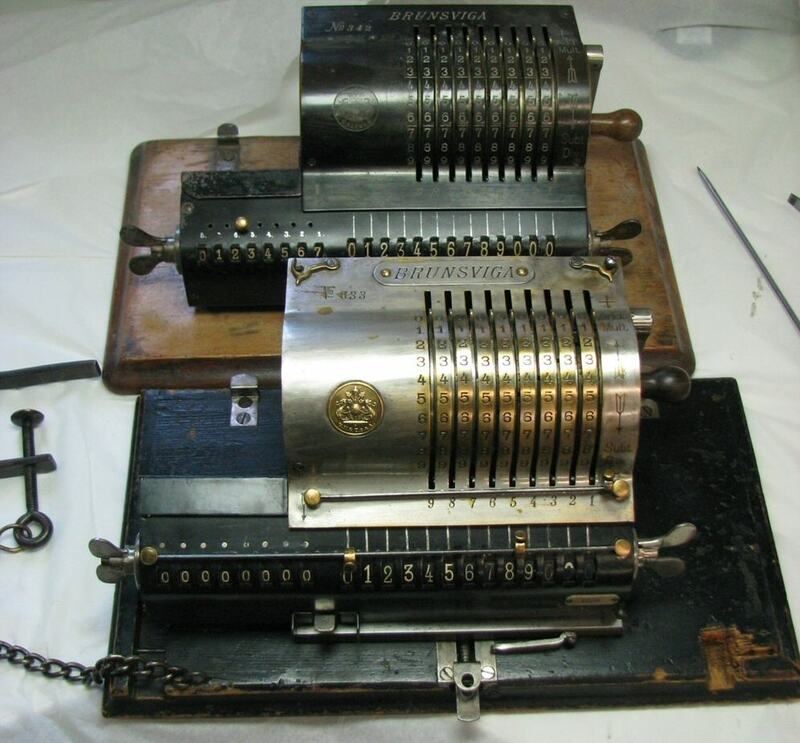 Since the calculator collection was only established in 1912, it is unclear whether the calculator either never left the factory, or was bought back (or traded for a newer model?) from the original purchaser. What has happened to the machine between 1892 and the 1950s will probably never be found out. Many people need to be acknowledged for being able to reach this conclusion. Dr. Jasmin Ramm-Ernst for her invaluable help, encyclopedic knowledge of all things Brunsviga and her healthy sceptisism of Valéry’s theory. Dr. Angela Klein from the Braunschweigisches Landesmuseum for allowing me to compare the machines closely, and the museum restaurator Olaf Wilde for assisting me with this. Chris Hinchcliffe of the Tekniska Museet in Stockholm for fearlessly embarking on a comparison exercise between the early Odhner and Brunsviga calculators in his own museum, Dr. Ina Prinz of the Arithmeum in Bonn for providing measurements and an opportunity for pictures, and many other enthusiasts the world over for providing me with measurements and pictures, or allowing me to photograph their precious machines and using their photo material for this article. And finally, the Internationales Forum Historische Bürowelt for publishing this article in their periodical "Historische Bürowelt". (C. Vande Velde, HBW (2013) Nr. 94, pp 17-24), and graciously allowing me to republish it here.